Berlin attraction-guides.com - Berlin, Germany attractions guide Berlin Television Tower (Fernsehturm) information about attractions, Television Tower in Berlin Area, Germany DE, tallest structure, observation platform, revolving restaurant, breathtaking city views, neon signs, Christian Cross, U-Bahn, S-Bahn at Alexanderplatz stops, location and address, Panoramastrasse, Alexanderplatz, tel / telephone number, opening hours, admission charges, and general tourist information about Television Tower (Fernsehturm) attraction in Berlin area, Germany DE Deutschland - Last updated 30/10/2012. The Fernsehturm Television Tower is the tallest structure in the whole of Berlin city and offers both an observation platform and a restaurant, which revolves slowly and features breathtaking views of the city. This impressive building is 368 metres / 1207 feet high and there is an elevator taking visitors to over 200 metres / 660 feet to a viewing platform and the restaurant. From here you can see all across the city and there are spectacular, panoramic views, probably the best in East Berlin. Because of these magnificent views, the popular restaurant can get very busy and it is advisable to book reservations in advance. There are numerous neon signs that surround the base of this tower and the reflections, which are caused by sunlight, form a Christian Cross on the tower. 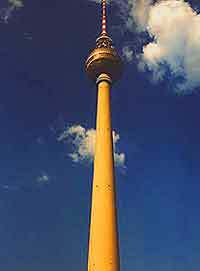 The Fernsehturm Television Tower can be easily reached by U-Bahn, S-Bahn at Alexanderplatz stops, or by bus.